You must be a member of the Mulhouse Culture Group to attend this activity. Would you like to join this group? This London based quartet group is the most fun you will ever have at a live concert. They offer something for all...electro, ethnic, dance, power and vibe in their wonderful ethnic electronic music. We saw them earlier this summer in Barfi (if you missed it - you missed lots of fun) because the group was amazing and exhilarated the crowd with its music and "shamstep" dance. 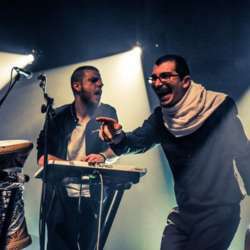 Shamstep electronic dance music is a movement in the Middle East and across Europe that combines electronic music, traditional dance and dancing. You can't help but move with their music. Their latest album received 4 out of 5 stars in a January Protected content in The Guardian and they made NPR's top Protected content selection. The band are playing at festivals in Protected content Walthamstow Garden Party, Fusion festival and Festival Med.